This was the best movie I saw in 2012 outside of The Avengers. 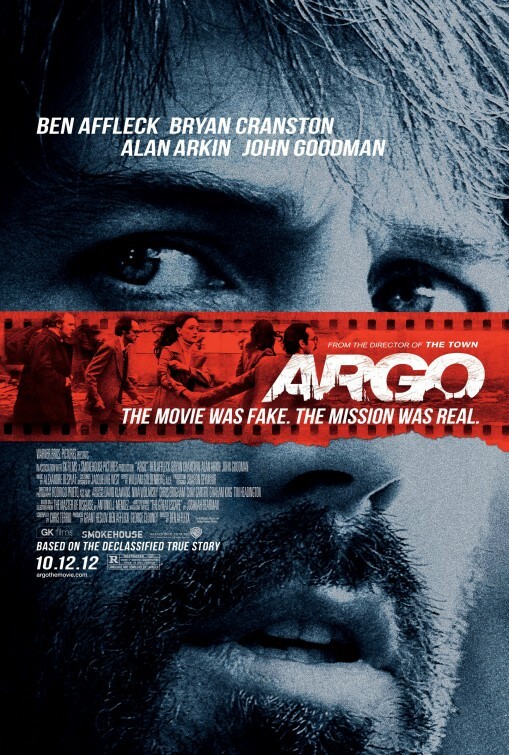 The climax of Argo is one of the most suspenseful I’ve seen in a long time. This is more impressive when you take into account that walking into the theatre, I knew exactly how this true story played out. When I know how a movie ends, and still can’t take my eyes off the screen, it’s so impressive to me. When I saw this in a theatre, I barely breathed because the sound of me exhaling carbon dioxide might impact these characters and their attempts to get out of Iran. Much of this movies success lies with Ben Affleck, he produced, directed and acted in this film and is terrific at every aspect. I’ve been so impressed with Affleck as a director. His success as a director has finally meant Affleck was able to stop just being known as Matt Damon’s best friend. His first mainstream film was The Town, which was amazing, but he improves again for this follow up. I think directing movies has made him a better actor too. The man seen in The Town and Argo is so far removed from the man who destroyed the Daredevil franchise. I’m happy he’s having success now because he seems like such a cool guy. I love his self depreciating humour. I was reading that after the uproar of him not being nominated for an Oscar for directing Argo, he kept a sense of humour noting that he also didn’t get the acting nomination, he pointed out, and no one’s saying I got snubbed there. I’m really excited for him to be the new Batman and can’t wait to see what he does with the character. The story of this is straightforward. Some American diplomats are hiding out at the Canadian consulate in Iran and can’t leave the country. Affleck, as CIA agent Tony Mendez, has to devise a way to get these six hostages out of Iran to safety. His plan is to pretend to be a movie crew that are scouting film locations for their Star Wars rip off film called Argo. Affleck creates a dummy film studio to further create the ruse that this film exists and is in production. He goes as far to get some production art made by famed comic book artist Jack Kirby and hires a couple of old school Hollywood talent (Alan Arkin and John Goodman) to run his fake production office. I can’t recommend this film enough. Everything about it is quality. The acting, directing and dialogue is first class. The film holds your attention well, all the way to the exciting final 30 minutes where you won’t be able to look away from the screen as Affleck and his ‘film crew’ attempt their escape. Argo is right up my alley. A true story about the improbable rescue mission of six American hostages in Tehran, set during a complicated time in American history. While the movie is excellent, it does fudge a lot of the details to add drama to certain scenes (that’s Hollywood for you). So while I highly recommend this movie, I also suggest reading the Wired article that inspired it for a more complete and accurate account of what happened. As stated, this is a great movie. Many scenes throughout were inspired by photographs of the real life events, adding some historical authenticity. It hops effortlessly between tense scenes of revolutionary Iran and the absurdity of Hollywood moviemaking. It’s difficult to bring any humor or levity to stories that are very much serious, but Argo excels at walking that fine line. My only problem with this movie is that CIA Agent Antonio “Tony” Mendez, the man who escorted the hostages out of Iran, is portrayed by Ben Affleck. Mendez’s Latino heritage is not merely obscured by casting an Anglo actor, but almost entirely erased. His surname is maybe mentioned once during the entire film, and his backstory is altered to make him from New York instead of Nevada. Is his ethnic heritage essential to the movie? No, but it would have been nice to see a Latin American actor starring in an Oscar contender film. Just there, no big deal, the same way white actors are.